After searching for many years for a chance to rear the California Pipevine Swallowtail (Battus philenor hirsuta), we have finally been able to lay our hands on this species today on our trip to Tilden Regional Park of Berkeley, CA and have finally completed our collection of local Swallowtail species! 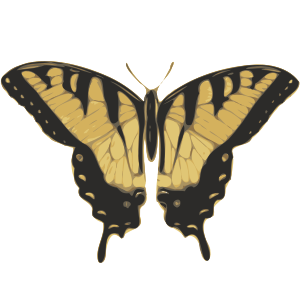 Starting many years ago, we have always been on the lookout for swallowtails -- all kinds, any kind, anything we had a chance of finding locally. Despite the regional checklists on Butterflies and Moths of North America, we can say with some certainty that Pale Swallowtail (Paplio eurymedon) and, especially, Two-tailed Swallowtail (Papilio multicaudata) populations do not exist in Albany, California and areas of very close proximity in the bordering cities of Berkeley and El Cerrito. That left us with three species on our hit list: Papilio zelicaon, Papilio rutulus, and Battus philenor. The first two swallowtails were relatively easy to encounter because they are more tolerant of the city environment. . . . In the August of 2012, we found our first swallowtail Papilio rutulus or Western Tiger Swallowtail in our yard. Interestingly enough, despite being our first species we have found since then that they are actually incredibly difficult to find. Next August, in 2013, we found our second swallowtail Papilio zelicaon (subspecies zelicaon; does not have "gothic" forms) or Anise Swallowtail in a local garden. Unlike Western Tigers, we have discovered them to be a very common species and are now swamped by them each summer. Their population has only grown since 2013. Finally in 2015, also in August, we first laid our eyes on Battus philenor (North California subspecies hirsuta), one of our largest local butterflies along with P. zelicaon and P. rutulus, on a trip different to Tilden Regional Park of the East Bay Regional Park District. We encountered a caterpillar on California Pipevine (Aristolachia californica), but to our great dismay the caterpillar died mysteriously immediately after we had attempted to collect it. Our best guess was that it had been the victim of a mean disease, or perhaps a parasite. This year, with great determination, we carefully planned this weekend's trip to Tilden for the specific purpose of finding Pipevine Swallowtails and finally completing our lineup. Tilden park consists of sunny mountain areas with open woodland, providing the perfect habitat for B. philenor and many other species. With summer just around the corner and the reassuring mid-June heat, we took this as our best and only chance to search for eggs. When we arrived, the first step was to locate Aristolachia, the caterpillars' host plant. The vine is a native to California, and tends to grow in shady areas near water. However, the first plant we found was growing along a wooden fence in a sunny area which we took as a good thing since the butterflies are more willing to oviposit in the heat. Here, with incredible joy, we emerged triumphantly with a group of eight third instar Pipevine Swallowtail caterpillars feeding together in a gregarious state. They were extremely conspicuous on the ordinarily green-colored California Pipevine due to their aposematic bright red tubercles. Clearly, they carry a nice shot of plant toxins derived from the poisonous pipevines, a characteristic of all pipevine-eating swallowtails and their tropical Birdwing relatives (tribe Triodini) that all specialize on Aristolachia. After some further inspection we found two more larvae of fifth instar, but they were not feeding gregariously. B. philenor caterpillars are only gregarious in the younger instars and become increasingly solitary as they grow larger. In addition, we were amazed to discover that a very generous butterfly must have recently passed by and oviposited because we collected a total of 53 bright red eggs on this vine, found in three clusters of 16, 16, and 21. Since both fresh eggs and mature caterpillars were present at the same time, they must exhibit at least two generations a year in this area. After depleting this pipevine of it's stock, we found another vine crawling up a tree in the shade. Unfortunately, it was located in a rather awkward position for us to examine it and we were not able to get a very good look at it. Nonetheless, we almost jumped out of our socks when we found two majestic fifth instar caterpillars. One of them was HUGE, and we measured it to be 2.25 inches (neutral position, not "stretched out"). Compared to mature P. zelicaon caterpillars, it was enormous. On a third pipevine, we discovered another fifth instar and a lone second instar (where are your friends??) for a total of 15 caterpillars. Like with most Swallowtails, we give credit for our luck to the fact that these vines were relatively isolated. But needless to say, we were very satisfied with our find! When we arrived home from our adventure, we set up two medium sized enclosures using pet-store plastic critter cages with air holes. We placed the nine third instars in one enclosure and the fourth and fifth instar caterpillars in the other. For the second instar caterpillar and eggs, we used small petri dishes. Unlike P. zelicaon, these guys were really active, probably because they are aposematic rather than cryptic and do not have to worry about being exposed by their wild movements. With so many caterpillars and a bountiful supply of eggs, we have very high hopes and can't wait to see how far we can go with these swallowtails!